Every player goes through it. They have extremely productive careers and then they hit a certain age where they begin to lose their abilities. It starts slowly at first. 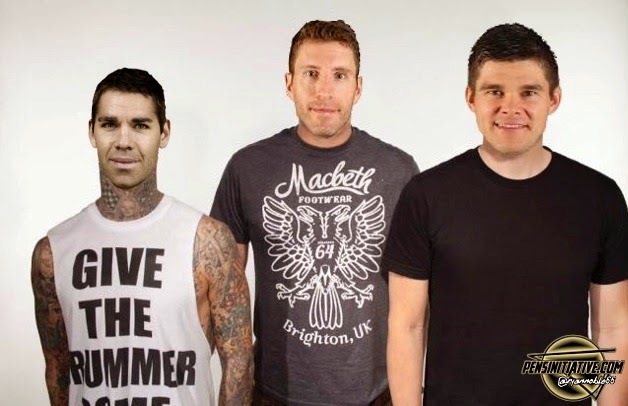 Maybe they can't skate as quickly as they did. Maybe their wrist shots are a little less fast. Maybe they just lose a bit of their vision to create plays or finish them. Once this starts, it usually creates an avalanche effect and the player is left contemplating retirement quickly. Many times this happens to players of any sport in their mid-30s, but Chris Kunitz, Pascal Dupuis, and Rob Scuderi are bucking the trend this year for the Pittsburgh Penguins. Chris Kunitz is the first person on this list. The cap hit of his contract is a tick under $4 million a season. Jussi Jokinen, Drew Stafford, and Jiri Hudler are all making slightly more than he is in terms of their cap hits. 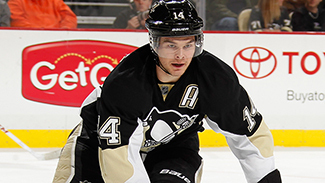 As of Sunday, Chris Kunitz is second on the Penguins with 8 goals, which is one more than Sidney Crosby. He is tied for sixth in the NHL in goals and tied for twelfth in scoring. There is no doubt that he enjoys an uptick in production playing alongside Sidney Crosby, but he is a great player in his own right. He is coming off a career season with 35 goals and 68 points. He also earned an invitation to be on the highly competitive Canadian Olympic team last year. Let's remember that he was undrafted out of Ferris State, and now he is making a living in front of the net for the Penguins. With a quick release on his shot and the ability to outwork and out-physical his opponent, Kunitz is in the prime of his career. He looks poised to be near 30 goals and 30 assists again this season. His production makes his contract a bargain and a sure mainstay on the top line alongside Sidney Crosby. A rather surprising appearance on this list (although not the most surprising -- that is #3), Pascal Dupuis is having quite the bounce back season. After two 20 goal seasons and a great start to 2013-14, Dupuis suffered a season ending ACL injury after Sidney Crosby fell on his leg during a game against the Senators last December. He made a speedy recovery and participated in some of Penguins' training camp. Many questioned what player would come out of the tunnel for the 2014-15 season. He had been the heart and soul of the Penguins the past few years -- that part would remain the same. He was also a fan favorite -- that would also remain the same. Many fans, however (myself included), tempered expectations for him this season. The fact is that he was 35 years of age and coming off a devastating knee injury. He would still contribute but surely he would not be the same player, right? Well, it has been only thirteen games, but Dupuis looks better to me than he ever has. He is very fast on his skates. He already has 4 goals and 9 points on the season, and he looks to be playing well alongside Evgeni Malkin. This has been incredibly important given Malkin's history of having trouble creating chemistry with linemates. Combine this with the departure of James Neal in the offseason and Beau Bennett suffering a preseason injury, and the beginning of the year could have been a disaster for Malkin. The fact that Dupuis was able to step onto the second line seamlessly is a big reason the Penguins have been so successful in the early part of this season. Dupuis has also been getting valuable minutes on the penalty kill and the second unit of the power play. Additionally, he earned a ton of respect from his teammates and fans after the way he bounced back from a scary situation against the Dallas Stars earlier this year. He took a cross check to the back and a slap shot to the neck while screening the opposing goaltender. After falling to the ice with numbness in parts of his upper-body, he eventually was taken from the ice on a stretcher. In what looked like a potentially long-term injury, Dupuis, somewhat miraculously, played the very next game. He has been everything the Penguins have needed so far and then some, and it does not look like he is slowing down anytime soon. Last year Scuderi ranked 34th out of 37 players in +/- for the Penguins. He finished with a -8 and was on the ice for 38 5-on-5 goals. 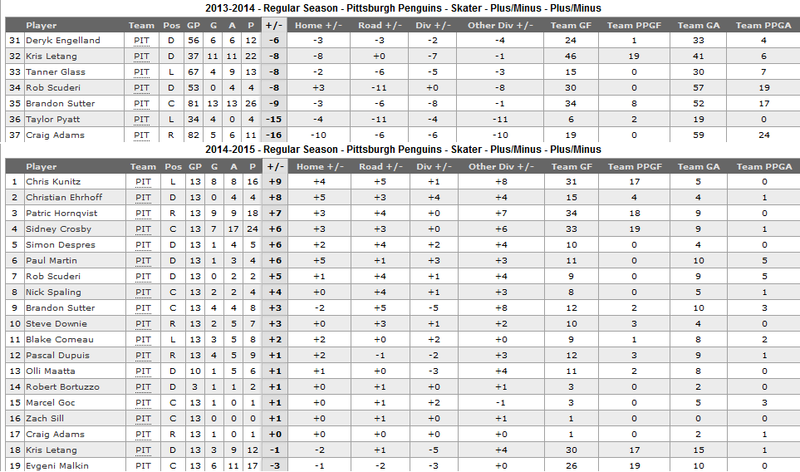 Scuderi is a +5 to start the 2014-15 season and has only been on the ice for four 5-on-5 goals. Johnston and the Penguins have also been smarter with Scuderi. Johnston has decreased his average ice time from last year from 18:55 per game to 17:20 per game but his shorthanded average ice time has gone up from 2:38 per game to 3:12 per game this season. He has been a solid stay-at-home defenseman and is one of the biggest early surprises this season. 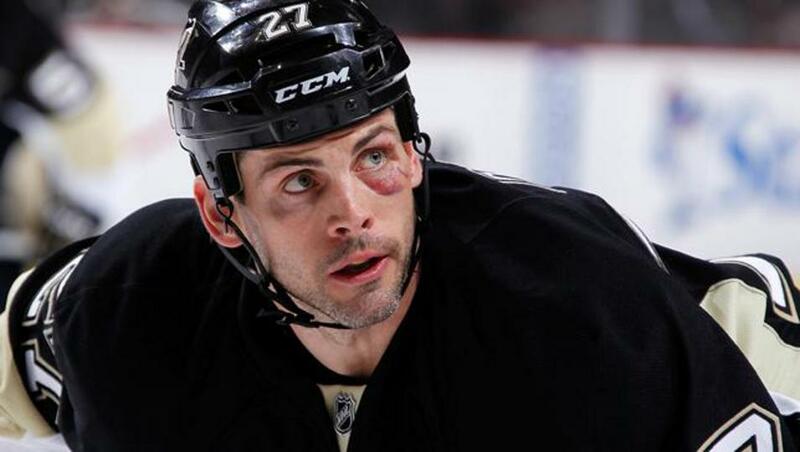 I will just mention quickly that I think 37-year-old Craig Adams is also doing well this season. That is not to say that a player like Jayson Megna cannot bring more to the fourth line, but Adams is playing his role well. He provides grit and toughness when necessary, and he is a steadying force on the penalty kill. He is rarely out of position and he has even chipped in a breakaway goal -- feels odd to type that. To win a Stanley Cup, teams need to find the perfect mixture of players. Part of that is getting veteran production while finding youth contributions as well. Kunitz and Dupuis' contributions are not that surprising, but Scuderi and Adams will need to keep playing well all season, including the playoffs, if this team will finally make its way back to the Stanley Cup Finals again for the first time since 2009.